We started as a small group of practical dreamers who have been producing events, fundraisers, protests, rallies, parties, socials, concerts, and pretty much anything imaginable in the arts, environmental, educational, music and culture scene in Vancouver for close to a decade. Together, in 2016, we formed the Non-Profit organization Create Vancouver Society, to be the organization that oversees all goings-on with the festival, and have been building this organization ever since! (check the About page for the new team members). 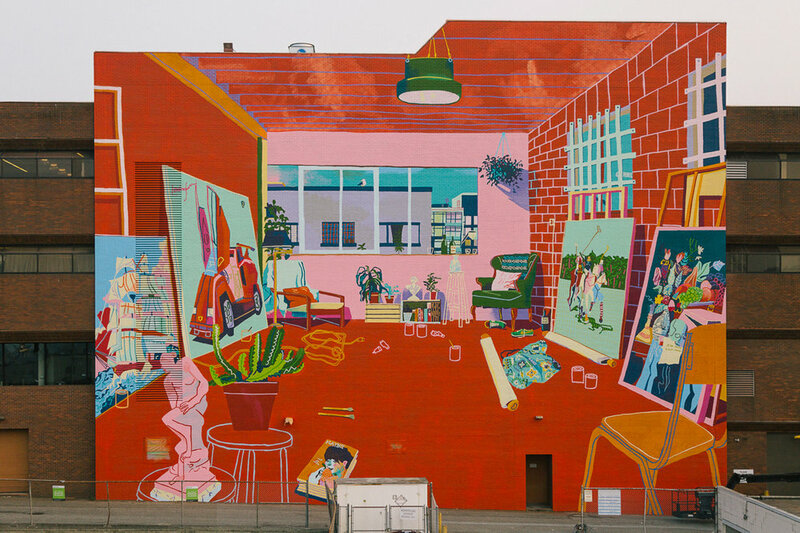 The Vancouver Mural Festival was founded on the idea of producing and celebrating diverse and accessible beautiful public art that would transform the way Vancouver understands and cares for culture, heritage, and its people. We aimed to build a platform to empower and support a broad array of individuals and organizations so that they could employ art and events in free public space as a tangible and long-lasting way to invest in our shared communities. This continues to include many artists whose work does not always fit into more established art venues. In our second year we began exploring how our festival could have a practical impact on particular objectives such as reconciliation with local Indigenous Nations, de-stigmatization of graffiti art in Vancouver and reclamation of laneways and streets as accessible, safe and creative public places. The City of Vancouver and Vancouver Mural Festival exist on the un-surrendered lands of the Musqueam, Squamish and Tsleil-Waututh First Nations. From the beginning, knowledge of this fact has been a call-to-action for the organizers of VMF to find out how our festival could contribute to the ongoing process of reconciliation and redress with local indigenous people. VMF is committed to providing a platform for the people of the three local Nations and Indigenous folks from other Nations - to participate in the festival as artists, staff and advisors. We look forward to sharing some stories in this blog about how these values have manifested into practical approaches and outcomes over our first few years. This includes Indigenous-led youth workshops, major mural installations and more. We are standing on the shoulders of many individuals and organizations that have already made strides in creating accessible and inspiring public spaces in the alleyways in Mount Pleasant. Rob Sutherland, who started Livable Laneways nearly a decade ago in the alleys West of Main St, saw the power of actualizing the storytelling and the congregatory potential of laneways. Mount Pleasant’s Community Plan (2010) created by hundreds of residents and community members promoted a “second face” for the neighbourhood with one of the principle suggestions being to install public art and murals to bring life to the alleyways. Check out the plan for Mount Pleasant’s Public Realm here. When we first proposed the festival, the parallels between the existing community plan and our vision for the festival were encouraging though not our only experience of discovering others with shared hopes for our city and communities. We were super excited to make somme these ideas reality. VMF is indebted to individuals like Rob Sutherland and organizations like the Vancouver Design Nerds, Mount Pleasant BIA, and VIVA Vancouver who first identified the alley behind the Lee Building as a potential public space. More on this story in a later blog. We couldn’t wrap this blog without mentioning the huge inspiration provided by Montreal’s MURAL Festival. Founded in 2012, MURAL shuts down the city’s busiest street to for a week-long free outdoor festival that celebrates public art and culture. We love how MURAL creates so much freedom for expression and possibilities of connection in public space. Inspired by MURAL and the city of Montreal, we envision Vancouver's streets as public spaces for all to connect and celebrate while combating the notorious isolation many Vancouverites feel in this city. VMF will continue to look for opportunities to create accessible and safe spaces where people can connect with each other and feel a stronger sense of belonging in their neighbourhood.